Formula 1 supremo Bernie Ecclestone has played down the chances of HRT suitors Scorpion Racing winning an entry for the 2013 championship. As AUTOSPORT reported on Tuesday, a group of Canadian and American investors are pushing to try and secure HRT's entry for the forthcoming F1 campaign. AUTOSPORT understands that the FIA believes the 12th entry slot for 2013 was closed off when it was informed at the end of last season that HRT had been liquidated. Ecclestone has been in contact with the Scorpion Racing group, and wrote to investors saying: "Have you bought the HRT company? Because if you have, they [the FIA] would be accepting you." He told the UK's Press Association, however, that an entry for 2013 was unlikely. 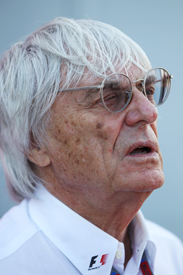 "I've spoken to them and told them to get in touch with the FIA and ask for an entry," Ecclestone explained. "They want to buy all the bits from HRT, then form a company and ask for an entry, but I personally don't think it will happen. "It's all a bit too late. Maybe they could do it for next year." The due diligence on Scorpion Racing's buyout plans could be completed this week. A Silverstone base, rather than HRT's Madrid headquarters, has been mentioned.